In Search of . . . 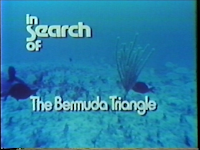 The Bermuda Triangle, narrated by Leonard Nimoy and first broadcast on April 27, 1977. In this episode, the ISO research team explores disappearances and legends surrounding the Bermuda Triangle, perhaps the quintessential 1970s paranormal conspiracy theory. This episode explores the mystery by reviewing specific events and interviewing actual participants in noted incidents. This provides a historical record of their testimonies for those researching the Bermuda Triangle. In typical ISO form, the producers do not evaluate any claims or evidence for their validity, they simply report what others have reported; however, this gives the impression of tacit approval of the otherworldly conspiracy theories. Many of the disappearances previously attributed to “mysterious” circumstances have since been determined to have had very natural explanations, either due to misreported facts or rare ocean and weather phenomenon. Nevertheless, ISO detours into the Twilight Zone when it highlights a bizarre call to a Fort Lauderdale, Florida, late night radio show about the Bermuda Triangle warning that the disappearances have an extraterrestrial origin. Why the producers spent any time on such nonsense is puzzling except that it fits in with the emerging New Age narrative of 1970s pop culture. I do recall watching this episode when it first aired and being completely fascinated, and a little terrified, by the possible existence of a Bermuda Triangle. While I discount any supernatural explanation of rare, but otherwise explainable events, what keeps me going back is the wonderful writing. It creates an atmosphere of mystery and draws you deeper into it. 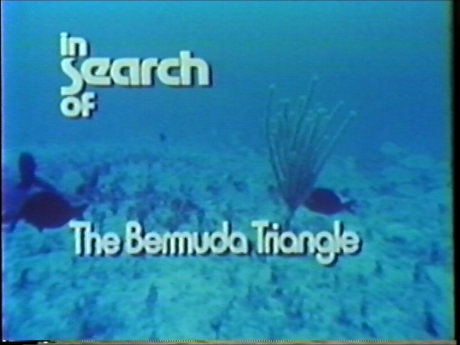 Despite knowing better, I can’t help getting lured into the enigma of the Bermuda Triangle, even a little, because of the script and, of course, Leonard Nimoy’s wonderful narration.